Cats Oil Painting on Canvass, "Lovers", 9x12, by Mercedes Franklin, Artist's Collection. These 2 beautiful cats were mine. They have since passed & so have their 2 sweet daughters. When Noodle Pie was giving birth we kept him away worrying that he might do something rash. But he kept talking & pacing till we let him in. He cared for them just as much as their Mother. Who knew what a good Father & Mate he would be till the day he died. This painting, along w/Oysters, Shrimp & Citrus, has been accepted in the 54th Bay Annual Juried Art Show running through April 14th 2017. Oil Painting, Dog, "Happiness", Labrador Retriever, 18"x24", by Mercedes Franklin, For Sale. Dog, Golden Retriever, "Watching The Kids", 15"x24", by Mercedes Franklin. Private Collection. .
Dog Oil Painting on Canvass, American Water Spaniel, "What A Great Day", 24"x20", by Mercedes Franklin. For Sale. I have the famous photographer "Ylla" to thank for the use of this photo. You can Google to see her body of work, books she has written & events in her life. She was quite an interesting person & inspired my "Flying Dog" series. This was the 1st painting, I have since finished #2 & 4, still working on 3 & 5. 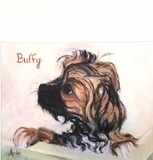 Dog Oil Painting on Canvass, "Buffy's Bath", 14x18, by Mercedes Franklin, Private Collection. She was sooo happy when the bath was over!!! 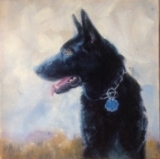 Dog Portrait Oil Painting on Canvass, "Chico", German Shepherd Black, 12"x12", by Mercedes Franklin, Private Collection. Dog Portrait Oil Painting on Canvass, "Georgia", Border Terrier, 11"x14", by Mercedes Franklin, Private Collection. 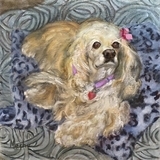 Dog Oil Painting on Canvass, Poodle, "Sleepy Time", 20"x24", by Mercedes Franklin, Artist's Collection. Dogs Oil Painting on Canvass, Poodles, "Afternoon Walk", 16"x12", by Mercedes Franklin, Private Collection. Dog & Boy Oil Painting on Canvass, "Going To School", Chihuahua, 14"x18", by Mercedes Franklin, Private Collection. 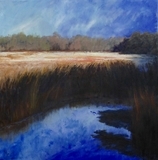 The Women Painters of the South East accepted this painting into their Juried Show. 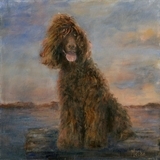 Dog Portrait Oil Painting on Board, Standard Poodle, "Road Trip", 10"x8", by Mercedes Franklin, Private Collection. Dog & Boy Portrait Oil Painting on Canvass, Mastiff, "Kaspian & Bautista", by Mercedes Franklin, Private Collection. Dog Oil Painting on Canvess, Standard Poodle, "Billie", 20"x28", by Mercedes Franklin, Private Collection. 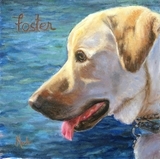 Dog Portrait Oil Painting on Canvass, Yellow Lab, "Foster", 16"x16", by Mercedes Franklin, Private Collection. Dog & Girl Oil Painting on Canvass, Keeshond, "Robin & Teddy", 20"x16", by Mercedes Franklin, Private Collection. Dog Oil Painting on Canvass, Pembroke Welsh Corgi, "Barcelona", 12"x16", by Mercedes Franklin, Private Collection. Barcelona was very much loved & a true companion to a good friend. He has since gone to doggie heaven and is very much missed. Dog Portrait Oil Painting on Canvass, Dachshunds, "Emily & Nikki", 8"x10", by Mercedes Franklin, Private Collection. Dog Portrait Oil Painting on Canvass, Rescue Dog, "Brandy", 8"x10", by Mercedes Franklin, Private Collection. Dog Portrait Oil Painting on Canvass, Golden Retriever, "Jake", 8"x10", by Mercedes Franklin, Private Collection. Dog Portrait Oil Painting on Canvass, Standard Poodles, "Josephine & Napoleon", 9"x12", by Mercedes Franklin, Artist's Collection. Dog Portrait Oil Painting on Canvass, Smooth Coated Collie, "Abby", 10"x8', by Mercedes Franklin, Private Collection. Dog Portrait Oil on Canvass, Golden Retriever, "Morgan", 8"x10", by Mercedes Franklin, Private Collection. Dog Portrait Oil Painting on Canvass, Bull Dogs, "Lisset's Dogs", 14"x18", by Mercedes Franklin, Private Collection. Dog Portrait Oil on Canvass, English Setter, "Bob", 8"x10", by Mercedes Franklin, Private Collection. Dog Oil on Canvass, Golden Retriever, "Angel Boy", 9"x7", by Mercedes Franklin, Private Collection. Dogs Oil Painting on Canvass, Boston Terriers, "Three Boston's", 24"x30", by Mercedes Franklin, Private Collection. Dog Oil Painting on Canvass, Golden Retrievers, "Bunky & Beau", 8"x10", by Mercedes Franklin, Private Collection. 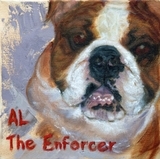 Dog Portrait Oil Painting on Canvass, English Bulldog, "Al, The Enforcer", 8"x8", by Mercedes Franklin, Private Collection. Dog Oil Painting on Canvass, Red & White Setter, "Cody", 14"x11", by Mercedes Franklin, Private Collection. Dog Oil Painting on Canvass, Chihuahuas, "Spike & Lulu", 16"x20", by Mercedes Franklin, Private Collection. Dog Portrait Oil Painting on Canvass, Boxer, "Harley", 20x16, by Mercedes Franklin, Private Collection. 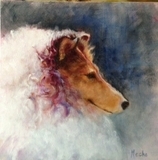 Dog Portrait Oil Painting on Canvass, Rough Coated Collie, "Duchess", 20"x20", by Mercedes Franklin, For Sale. Dogs Oil Painting on Board, Standard Poodles, "Pink Poodles", 8x10, by Mercedes Franklin, Private Collection. This is a story of 3 Generations getting ready for Easter. Mom is taking the photo so unfortunately we don't get to see her nor her Easter outfit. Then there is daughter & granddaughter. For those of you that might be concerned not to worry. These are totally safe vegetable dyes. If you haven't seen the convention of "Poodle Styling" on TV you should try. You can't possibly imagine what the stylist can do. Between the natural poodle hair & colors the designs are incredible. I do wish I had of photo of the entire family together. Dog Portrait Oil Painting on Canvass, Pekingese, "Daisy", 16"x20", by Mercedes Franklin, Private Collection. This is Mary's beloved "Daisy", her best girlfriend & companion. 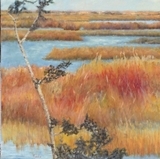 Oil Painting on Canvass, Marsh, Twilight, 12"x24", by Mercedes Franklin, In Private Collection. Floral Oil Painting on Canvass, "I Look Good Today, 20"x16", by Mercedes Franklin, For Sale. Floral Oil Painting on Canvass, "Azaleas", 16"x20", by Mercedes Franklin, For Sale. Bay Oil Painting On Canvass, "Piers Relaxing", 12"x16", by Mercedes Franklin, Private Collection. On days like this everyone & thing is relaxing. And so they should. Blue skies, blue water & warm breezes. It is all about the siesta. Bay Oil Painting on Canvass, "Fairhope Pier", 12"x16", by Mercedes Franklin, Private Collection. Oyster Oil Painting on Canvass, "Pleasantly Plump", 5"x7", by Mercedes Franklin. Private Collection. Each oyster has their own thing going on. This one, out of a dz, looked "pleasantly plum" & ready to eat. Oyster Oil Painting On Canvass, "Naked Joy", 5x7, by Mercedes Franklin. Private Collection. This painting was sheer "joy" to do. It came out of me through my brush onto the canvass so easily. When it was finished I felt great. And what a shell! One of the best I have. Oyster Oil Painting on Canvass, "Sweet Heart", 5"x7", by Mercedes Franklin. Private Collection. Red is my favorite color. So I had to paint an oyster w/this hue. It is my duty to this fabulous color that "Goes With Everything". This painting is my very own Sweet Heart! Oil Painting On Canvass, Oyster, "Mixed Emotions", 5"x7", by Mercedes Franklin. Private Collection. When I first laid out the paint on the canvass I had some beautiful red, orange & purple strokes. The painting came together in another way than I had planned but the lovely colors were right there in the midst of the oyster meat. I couldn't let go so I left them & have thoroughly enjoyed the view ever since! I wanted to paint oysters in a different setting with a different feel. Here it is!!! Oil Painting On Canvass, Oyster, "I'm Ready", 5"x7", by Mercedes Franklin, Private Collection. I set up this oyster shell so I would see the side of it. When I stepped back it would roll over as to say now "I'm Ready" The lovely little mollusca had it's way. He stayed put the rest of the painting. Oil Painting, Oyster, "Pretty Boy", 5"x7", by Mercedes Franklin, Private Collection. Oil Painting, Oysters, White Oysters, 9"x12", by Mercedes Franklin, Private Collection. Oyster shells fascinate me. No 2 alike. Sizes & shapes never ending. Not to mention colors. This group caught my eye. The shimmering colors are breath taking. They called out to be viewed by all. I hope I did them justice. 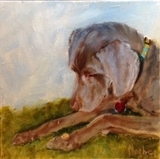 Oil Painting on cavass, Oyter, Basking In The Rays, 5"x7", by Mercedes Franklin, Private Collection. Oil Painting On Canvass, Oyster, "Golden Pearl", 5"x7", by Mercedes Franklin, Private Collection. For those of you unaware... I design a line of jewelry also. I believe that pearls should be a part of every girls jewelry collection. Each strand has a unique color & is looking for the perfect skin tone to accent. Enjoy your search. As for this painting, some of my favorite places are in the background. I like it when the entire painting takes your eyes for journey. Oil Painting On Canvass, Oyster, "Floating", by Mercedes Franklin, Private Collection. The summer has been hot. And I have been dreaming of the cool waters in the gulf. That is all it took. This is me floating and dreaming. Oil painting, Oyster, Under The Sea, 5'x7", by Mercedes Franklin, Private Collection. Oil Painting, Oyster, Slumbering Pearl,5"x7", by Mercedes Franklin, Private Collection. Oil Painting, Oyster, Velvet, 5"x7", by Mercedes Franklin, Private Collection. Oil Painting, Oysters, Turquoise Oysters, 12"x16", by Mercedes Franklin, Private Collection. Oil Painting, Oyster, "Showing Off", 5"x7", by Mercedes Franklin, Private Collection. Oil Painting, Oysters, Ready To Eat, 9"x12", by Mercedes Franklin, Private Collection. Oil Painting, Oyster, Out To Lunch, 5"x7", by Mercedes Franklin, Private Collection. Oil Painting On Canvass, Oysters, "Oysters With Lemons", 11"x14", by Mercedes Franklin, Private Collection.